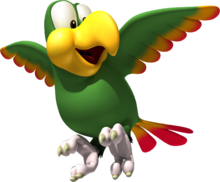 Squawks the Parrot is an Animal Friend in the Donkey Kong franchise who first appeared in the game Donkey Kong Country. Along with Enguarde, Squawks has the most non-cameo appearances of all the Animal Friends in the Donkey Kong franchise (however, Enguarde has the most playable appearances). Squawks is the only Animal Friend who fulfills multiple tasks throughout the series. 2.3 Donkey Kong Country 3: Dixie Kong's Double Trouble! In the original Donkey Kong Country, Squawks only appears in one level, "Torchlight Trouble". Once released from his crate, Squawks follows Donkey Kong and Diddy Kong through the pitch-black cavern. Armed with a bright lantern, Squawks lights up the surrounding area, allowing the Kongs to see ahead in this dark level. He is the only Animal Friend to not have an Animal Token. In Donkey Kong Country 2: Diddy's Kong Quest and Donkey Kong Land 2, Squawks is much bigger than in Donkey Kong Country, but otherwise looks the same as in his debut. His official artwork is recycled from Donkey Kong Country but with added detail and with the lantern removed as he serves a different function in this appearance. In this game, he can be directly controlled and used to attack enemies by shooting eggs from his beak. In some levels, Squawks can be released from a crate, and will then carry his Kong allies through the level, until reaching a No Animal Sign. In other levels, the Kongs can directly transform into Squawks by jumping into an Animal Barrel. Additionally, Squawks does not fly away when hit by an enemy. Instead, one of the Kongs drops from his claws, but Squawks remains playable as long as a second Kong remains. As such, he acts nearly the same when released from a crate as he does if the Kongs transform into him using a barrel, although he flies much slower when he is carrying the Kongs as he is slowed down by their weight. 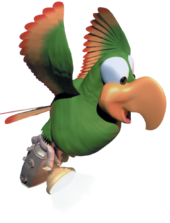 Squawks is also the first Animal Friend to fight a boss, having to fight King Zing, the leader of the Zingers, in his lair in Donkey Kong Country 2: Diddy's Kong Quest. He is also used to race against Screech. Parrot Chute Panic introduces a second, purple Squawks (later known as Quawks), who does not shoot eggs, and merely slowly descends down pits with the Kongs. In the monochromatic Donkey Kong Land 2, the two birds share a single sprite model. Squawks remains unchanged from his Donkey Kong Country 2 and Donkey Kong Land 2 depiction in the next pair of games in the series, Donkey Kong Country 3: Dixie Kong's Double Trouble! and Donkey Kong Land III. Squawks returns in Donkey Kong 64, where he is the same size as in his original appearance. It is he who first informs Donkey Kong that his Golden Bananas were stolen by the vile King K. Rool. In this adventure, Squawks fulfills a variety of roles. He acts as a guide and provides information to the Kongs and will also give them Golden Bananas and Cranky's Kong Barrels when a certain Kong plays on a Music Pad in DK Isles, carries Tiny Kong to high places in his claws if the young Kong shrinks herself and carries a lantern in dark caves (just like in the original Donkey Kong Country). He opens most of his dialogue with "Squawk!" and ends them with "Bwark!". Multiple Squawks can be seen in some cutscenes of the game. Squawks appears as a common item in the racing game, Donkey Kong Barrel Blast. There, he can be sent out by a racer to attack the player in front of them. Once the bird makes his way to a player, he will hover around the victim for a short amount of time, causing them to be unable to use Wild Moves for a few moments before he leaves. He will attack players who attempt to use a Wild Move, making them lose ten bananas and if he is summoned by a Kong, his attack duration will last longer. Squawks's appearance in Donkey Kong Country Returns. In Donkey Kong Country Returns, Squawks the Parrot appears as an item sold by Cranky Kong for 15 Banana Coins in his own shop. The player is allowed to buy an unlimited amount of Squawks if they can afford it. He helps the player(s) find Puzzle Pieces when purchased. When the player(s) are traveling through a level, Squawks the Parrot begins to yell from the bottom left corner of the screen when an undiscovered Puzzle Piece is near, giving the player(s) a hint to the Puzzle Piece's location. Squawks can also find switches in the Factory world; finding all switches opens the path to Feather Fiend. In Donkey Kong Country Returns 3D, he has the same purpose as in the previous game. However, if player chooses the New Mode at the start of the game, he will cost only 5 Banana Coins. Squawks returns in Donkey Kong Country: Tropical Freeze with the same purpose as in the previous game and its remake; to help the player find unfound puzzle pieces in levels. He can be purchased from Funky's Fly 'n' Buy for 10 Banana Coins. Squawks the Parrot with his flashlight in Donkey Kong Country: Rumble in the Jungle. In the 1995 novel Donkey Kong Country: Rumble in the Jungle, Squawks the Parrot makes an appearance within the interconnecting caves of several snow-capped mountains. Donkey, Diddy and Cranky Kong become trapped in the darkness of a large cave after an avalanche, while on their way to Big Ape City. Donkey Kong has the idea to call Squawks for help by crying out at the top of his lungs. Several minutes later, Squawks appears carrying a flashlight, and he agrees to show the Kongs the quickest route through the mountain. Squawks brings them to the cave exit which is closest to Big Ape City. After the Kongs thank Squawks, he returns to the caves and the Kongs proceed to the city. Squawks meets the Kongs in "Donkey Kong Country". 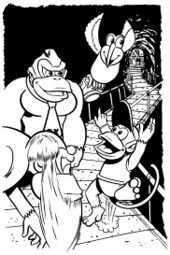 Squawks appears in the second part of the Club Nintendo comic "Donkey Kong Country" as an ally of Donkey and Diddy Kong. He is given to them by Candy Kong at her Save Point, and he brings them to a cave. Inside, the Kongs get attacked by a Kritter. With the help of Squawks, who uses his torch to project Donkey's shadow onto the wall, the Kongs scare the enemy away. After this event, Diddy and Donkey leave Squawks and proceed. 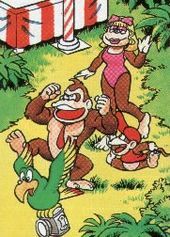 In "Donkey Kong in: Banana Day 24", a comic published in the same magazine, Squawks is seen conducting an "automatic parrot wake-up service" to get the Kongs off their palms in the morning. He uses a microphone and speakers to tell a joke. Diddy calls Squawks a "dumb parrot" and claims that he is telling the same joke every morning. In the Donkey Kong Adventure story of Mario + Rabbids Kingdom Battle, one of Donkey Kong's Bwananarang weapons, the Law of the Macaw, is designed after the appearance of Squawks the Parrot. The weapon's description makes a quip by stating that enemies are about to learn a serious lesson courtesy of the school of Squawks from this weapon. Squawks appears as an Advanced support spirit in Super Smash Bros. Ultimate, which removes fog or poisonous clouds from certain spirit battles. Instruction booklet bio: "Squawks is the one animal that you cannot ride, but he is helpful nonetheless. You can find him in the darkest cave level. Once you release him, he will hold a flashlight that will help light your path. Because he is so essential to success in this darkened level, he's not too hard to find when you need him." Instruction booklet bio: "Squawks's role in Diddy's new adventure is much more important. Rather than just carrying a flashlight, he can now lift both Diddy and Dixie for high-flying adventures. Squawks can also spit eggs at enemies if you press the button." Instruction booklet bio: "He can fly, but he's no lightweight! The egg-spitting Squawks returns from previous adventures to lift Dixie Kong and Kiddy Kong to higher ground! Squawks has relatives who can pick up barrels with their claws and bomb the baddies below." Instruction booklet bio: "Hops on the opponent in front of you and prevents them from using Wild Moves. (Boost: The effect will last longer.)" Instruction booklet bio: "Squawks will help you locate Puzzle Pieces." Instruction booklet bio: "Alerts you when a puzzle piece is nearby by squawking. You can take one Squawks with you for each level." Squawks has filled more roles than most animal friends. Remember when he carried a much-needed light through the caves? or when he carried the Kongs over danger? Good times, good times... Lately Squawks has helped by letting you know when Puzzle Pieces are near. So helpful! Whether lighting their way in the dark or carrying them through the air, Squawks the Parrot is a reliable ally of Donkey Kong and co. Lately, he's taken to sitting on branches and letting his friends know when there are puzzle pieces nearby. Quite the little helper! For this subject's image gallery, see Gallery:Squawks the Parrot. Ōmu no Sukōkusu Squawks the Parrot (Ōmu), from the English bird-call onomatopoeia, "squawk"
Chik From чик-чирик, the onomatopoeia of a bird call. Early in Donkey Kong Country's development, Donkey Kong was initially meant to use a mining helmet in "dark levels", and is depicted wearing it in two pre-release artworks. The item was eventually scrapped and replaced by Squawks. In Bonus Bananza, the player can guess "Squawks," "Squeaks," and "Flapper" when determining Squawks's name. Starting in Donkey Kong Country Returns, Squawks has been given two backwards-pointing toes just like a real parrot. In previous games, he was portrayed with only one. In Super Mario Odyssey, one of the roads in New Donk City is called "Squawks Park StreetMedia:SMO Shot - Squawks Park Street.png". ↑ Mark Stevenson on Twitter, retrieved June 6, 2015. This page was last edited on April 7, 2019, at 11:15.